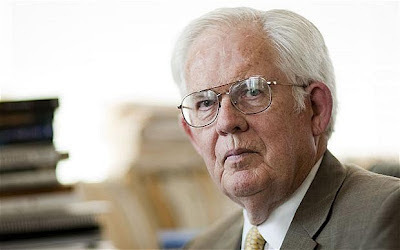 Bill Niskanen, long-time member and chairman emeritus of the Cato Institute passed away last October. This tribute video was presented at a Cato Institute memorial service last week. 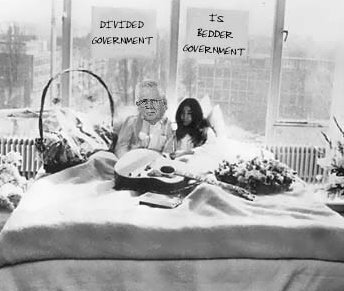 The Dividist considers Bill Niskanen to be the "godfather" of this blog. His work on divided government was our original inspiration and impetus to craft and advocate a consistent divided government voting heuristic. Our first post six years ago referenced Niskanen's analysis on divided government. His work was cited here repeatedly over the years. The video tribute is an appreciation of the man and his values. It highlights Niskanen's uncompromising conviction that empirical evidence must drive policies and politics, along with his refusal to let partisanship trump principle. Despite being a Republican and despite being part of the Nixon and Reagan administrations, he publicly broke with both administrations over price controls and federal spending. American voters, in their unarticulated collective wisdom, seem to grasp the benefits of divided government, and that’s how they’ve voted for most of the past 50 years. To be sure, divided government is not the stuff of which political legends are made, but, in real life, most of us would take good legislation over good legends. As a life-long Republican and occasional federal official, I must acknowledge a hard truth: I don’t much care how a divided government is next realized. And, in 2006, there’s only one way that’s going to happen." The Dividist appropriated Niskanen's title of this remarkable piece and was even inspired to exercise his rudimentary photo editing skills in a post promoting the article. ...is give divided government a chance." The essay is also reprinted in chapter 25 of Niskanen's last book "Reflections of a Political Economist - Selected Articles on Government Policies and Political Processes". For a limited time, the Cato Institute is offering the electronic version of the complete book at no cost. Get it and read it. Unfortunately, a tribute to Bill Niskanen's life and work is not complete without mentioning the controversy precipitated by his death. The Koch Brothers have been significant financial contributors to the Cato Institute over the years. Much of the good work of the Cato Institute over that time could not have been accomplished without their financial support. However, that financial support has not been without controversy and public friction between the Koch brothers and Cato Institute management. To the delight of statists on the left and right, the conflict has erupted into a public fight for Bill Niskanen's controlling shares currently held by his estate. A legal and public relations war for the heart, soul, and control of the institute is underway. The Dividist will not attempt in this post to sort through the competing issues. The Koch Brothers case is linked here. The Cato Institute management case is linked here. That said, if (as has been alleged) the Koch brother's actions are primarily motivated by a desire to make the Cato Institute a more effective tool to stop Barack Obama's reelection in 2012, then reconciling their actions with the public non-partisan divided government views of Bill Niskanen is problematical to say the least. Of course, there is no telling for certain how Nikskanen would have felt about the upcoming election. But it is interesting to note that with the GOP a virtual lock to keep majority control of the House, and a very good chance of taking control of the Senate, the divided government vote in 2012 is a vote to re-elect Barack Obama. Which scenario do you think Bill Niskanen would have seen as preferable in 2013? One Party Republican Rule under Mitt Romney? Or a divided government with Obama as president and the GOP in control of Congress? I suspect that Bill would ask - "Which scenario has more empirical historical evidence to support a more libertarian 2013?" The answer to that question is clear.